The entire overnight interrogation of the man accused of killing Kathryn Steinle two years ago on a San Francisco pier can come into evidence in an upcoming murder trial, a Superior Court judge ruled Monday. Defense attorneys for Jose Inez Garcia Zarate had sought to exclude their client's statements from the jury, arguing that an officer's misstatements of the Miranda warning, Garcia Zarate's repeated demands to end the interview and some aggressive questioning from an SFPD sergeant resulted in a coerced confession. "The police got him to tell a narrative that was false but that incriminated him," Deputy Public Defender Francisco Ugarte said after court on Monday. 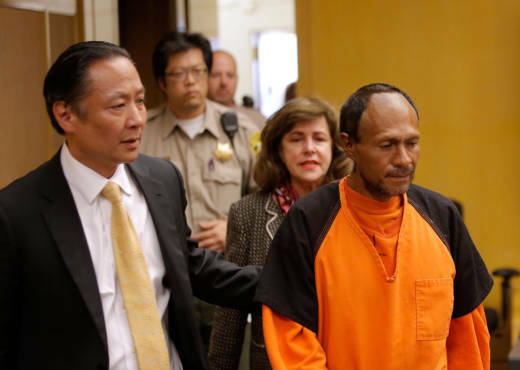 For example, Ugarte said, Garcia Zarate told the police he shot Steinle from 5 feet away, when he was actually about 90 feet away from her, on July 1, 2015. The defense plans to argue that Garcia Zarate shot Steinle by accident after he picked up an unknown object wrapped in a piece of cloth, which was a handgun stolen four days earlier from a U.S. Bureau of Land Management ranger's parked car. "He [Garcia Zarate] did try and explain what happened," Ugarte said. "The police were not accepting of an accident scenario and eventually got him to say things that were factually untrue." Prosecutor Allison Macbeth successfully argued that Garcia Zarate's statements that he didn't want to talk to the officers, that "I'm not going to keep answering you with words," and that "I'm not going to answer anymore" were not unequivocal and clear assertions of the defendant's right to remain silent. "His confession was voluntary under the circumstances," Macbeth said in court. She argued that Garcia Zarate switched between demanding to end the questioning and requesting to sign a confession. And each time Garcia Zarate said something indicating he wanted to stop answering questions, he then kept talking. "He engages with a willingness to keep answering questions and keep incriminating himself," Macbeth said. In one moment during the interrogation, SFPD Sgt. Anthony Ravano slammed his hand on a table and demanded Garcia Zarate tell the officers what happened. "The fact that an officer uses these types of techniques does not make the statement involuntary," Macbeth argued, denying the officer was coercive or intimidating. "There were no threats in this case." A different officer who read Garcia Zarate his Miranda rights at the start of the questioning misstated the Spanish translation, the defense argued, advising Garcia Zarate that he had "the right to wait for silence" instead of a right to remain silent. The officer also reportedly misstated the word "interrogation" in the portion of the advisement about a defendant's right to have an attorney present during such questioning. "The translation need not be perfect so long as the defendant understands," Macbeth said. "The defendant expressed no confusion." In a related ruling, Judge Samuel Feng excluded from the trial a television interview Garcia Zarate gave from jail days after the Pier 14 shooting, portions of which the defense sought to show the jury. Chief Deputy Public Defender Matt Gonzalez told the court the television interview was "more trustworthy" than the police interrogation. "He's had time to sleep," Gonzalez said. "He's walking into a room where there isn't the same antagonism there was at 3 or 4 in the morning." Feng did not explain his reasoning beyond listing the case law, motions and evidence he reviewed to reach his decision. "The court had the opportunity to look at the demeanor of everyone," he said of the police interrogation. "It's not just what they say. It's how they say it."